In some ways, the digipack graphics and album title are a bit misleading (but only partly) for this exquisitely conceived and executed album from Gina Leneé. The usual perception of diamonds is that they convey elegance, refinement, and the finer things in life. Lenee’ is likewise stunningly photographed in a red evening dress, the epitome of beauty and sophistication. These descriptors might incline the listener to expect music superficially pretty, more concerned with appearance than substance. Nothing is further from the truth. The ten tracks on Red Diamonds offer music which is rare and special, much like the real red diamonds. From the liner notes: “Red diamonds are the most rare and precious of all diamonds, only a handful existing in the world. Their mystery, passion, and fire is beyond compare, captivating those who become their beholden.”). Leneé specializes in a type of piano music that marries the sparseness of quasi-minimalism with warmth and sensitivity. She imbues every song with obvious heartfelt sincerity. That her composing is equally strong–some of these melodies are just flat-out gorgeous–just ups the ante on stating how good this recording is. Now throw in that she procured Ackerman/Eaton to sit in the production booth, and enlisted their crack team of usual suspects (see above) and it would likely be a shock if this album was anything other than spectacular. Whether it is the obvious connection to diamonds, or the color red, or the track titles, to me this music is all about affairs of the heart, whether it be winning in love, losing in love, or something in-between. In this way, perhaps the best perspective to hold is that Red Diamonds is a love letter to love itself, from a talented and soulful pianist. In the liner notes, Will Ackerman states “Gina is a romantic whose vision goes way beyond clichés.” I completely agree with that, except that I would add she finds a way to craft rich romantic music that, while not going in bold (and inaccessible) directions, still sounds fresh and new. That is no easy task. Song titles indicate just how closely linked these compositions are with romance and love, such as the opening beautiful but melancholic “a thousand days without you,” or others, e.g. “soulmates,” “carry me away,” and “the beautiful, the broken.” Leneé specializes in fusing her rich melodies with a reflective mood so that this album would be well-suited for daydreaming or, perhaps on a cloudy grey day, musing over past romances long since soured. On the other hand, this is not in the slightest bit depressing music, it merely mirrors (on some tracks) how love is not always sunshine and rainbows, but that’s just it, isn’t it? Love is always worth the cost we pay, because where would be without it? “carry me away” is notable on the album as being one of the few “uptempo” pieces on the CD and even then, the energy in the piece doesn’t ramp up until one third of the way in. At that point, Leneé is joined by Jeff Haynes and Premik Russell Tubbs and the three playfully intertwine piano, ewi, and hand percussion. Later, more musicians also contribute to the piece. “the moment” which is next, shifts gears dramatically, conveying a soft bluesy mood, and it sounds like nearly every guest star is in on this track. Leneé meshes particularly well with Premik Russell Tubbs, but it actually sounds like these artists have played together for years on this song. I imagine credit for this sensation of simpatico has to be given to producer Will Ackerman. I also love Noah Wilding's whispery, sensual vocals on this number, too. The title track is another song that dials up the tempo and energy, this time via Charlie Bisharat’s violin which takes the lead over Leneé’s backdrop of the melodic refrain, along with Haynes’ percussion. “the beautiful, the broken” is appropriately downcast but it is one of the prettiest songs here. The title reminds me of Tim Story’s equally somber and equally beautiful “The Luminous, the Dark” from his masterpiece, Beguiled. While the songs don’t technically sound alike, they inhabit the same musical soundscape. 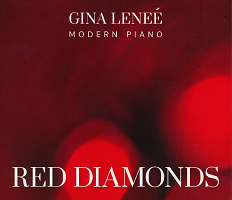 Red Diamonds is not Gina Leneé’s debut, but it is the first that I have heard. She first came on the scene in 2002 with From The Heart. After this album, though, it would not be a stretch to state that her reputation as an artist to pay particular attention to will spread far and wide. I would certainly hope so, as talent like hers deserves a huge audience.